Smiles all around as Brother Will and a student at St. Aloysius accept our temple’s annual donation to the Hunger Center. 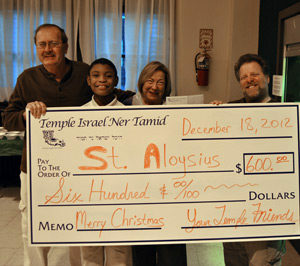 Claudia Madden and Rabbi Matt presented the check before the St. Al’s Christmas Dinner on December 18. It is always good to do a mitzvah. Our congregation works diligently to engage in the mitzvah of tzedakah. We have been helping to feed the poor in Glenville since 1984. Where? The St. Aloysius Church is located at 10932 St. Clair Avenue, Cleveland, Ohio, 44108. To help, contact Claudia Madden though the Temple office. If you do not call, that’s okay; just come into the Church’s school gym. It will be greatly appreciated. When? We serve dinner at the St. Aloysius Hunger Center the FOURTH Tuesday of each month. At 4:00 p.m. we heat up the meal and prepare the side dishes. At 5:00 p.m. we serve dinner. Arrive anytime between 4 p.m. and 5 p.m. Usually, we finish before 6:00 p.m. Feeding the hungry is a significant mitzvah. In the words of the prophet Isaiah, which we read on Yom Kippur morning, “Is such the fast I desire, a day for people to starve their bodies? Is it bowing the head like a bulrush and lying in sackcloth and ashes? Do you call that a fast? No, this is the fast I desire! To unlock the fetters of wickedness… to let the oppressed go free… to share your bread with the hungry….” (Isaiah 58) Feeding the hungry requires a serious commitment, especially for a congregation of our size. St. Aloysius is our monthly opportunity to heed the prophetic call and to be an example to others. Please be a sponsor at $180, which equals 10 times chai. If you, your friends, your place of work, or professional organization would like to sponsor a St. Al’s dinner, please contact the Rabbi. On average, we feed 100 people each month. In November and December, for the Thanksgiving and Christmas dinners, we serve about 150. Times are lean. We need your help. October 2014 marked our 30th anniversary serving dinner at St. Aloysius. The Cleveland Jewish News was there to cover the event. TINT’s Peter Freimark and Joy Gray (second and third from left) join Jo Cowan and Sheldon Herzog to cook meals for over 100 people at St. Al’s.